This week, we’re back in America to meet Raven and her human, Elaine. 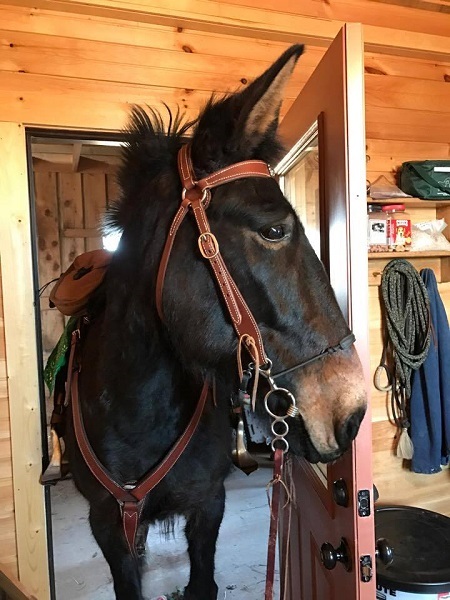 This lovely molly is a great example of the effect that a good start will have on a mule; you can’t go wrong with a mule who’s been well-handled from day one! 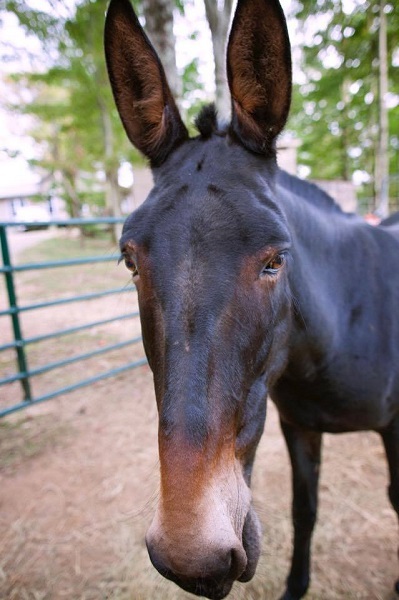 Raven is a 14-year-old molly mule out of a Tennessee Walking Horse. I was fortunate enough to find her as I started my search, at the age of 58, for a solid safe mule for myself. She was raised and trained by a single woman who watched her be born on her own farm – I like to think that we are such a good fit because of her first 8 years with this woman. Raven’s great early training was immediately apparent by her calmness, her ability to load effortlessly in a trailer, and she is such a delight for any farrier. 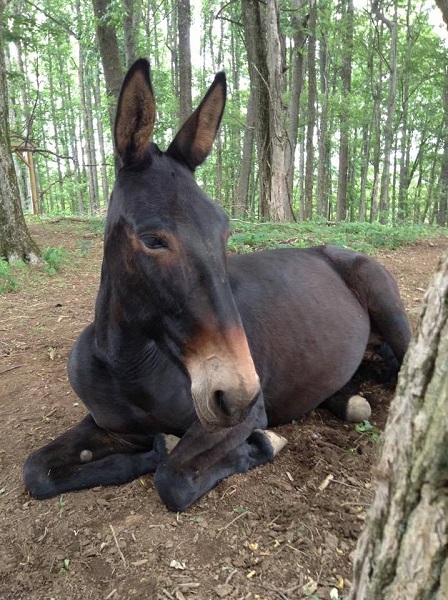 Raven has two pasture mates, both donkeys. Nellie Bly came to live with us six months after I got Raven as a companion, it was love at first sight! Ruby came to the farm this past January as a companion for Nellie Bly when I take Raven off trail riding. 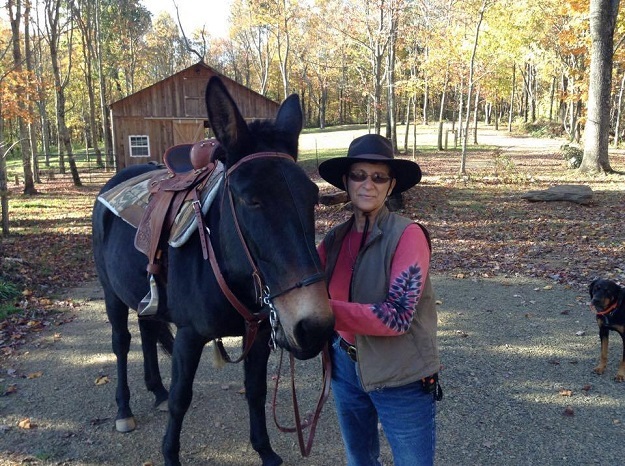 On June 27, 2011, I made an appointment in Rhonda, NC with Windy Hill Mule Farm after months and months of searching for a safe mule for myself. I rode her that day after not having ridden since 1987!!! I was quite nervous, but her calmness and the ease of guiding her around their farm made me very sure she was the one for me. 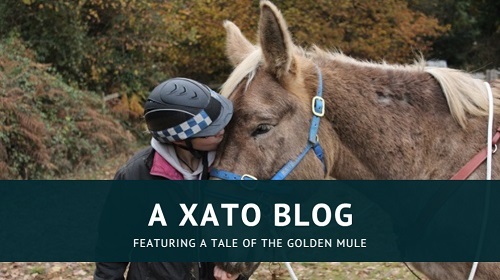 The people that ran the farm were extremely concerned about matching the right mule with the right person and their experience and abilities. Raven and I have primarily ridden around my 10 acre farm where I have made several trails that wind around through my woods. I also ride her around the neighbourhood. I have recently retired, and now have a truck and trailer so we are loving getting out trail riding and meeting up with other riders. Future plans include training her to drive. My relationship with Raven has evolved greatly since she first came to the farm. She has always been a calm and trusting girl. As the years have gone by we have a closer understanding of one another. 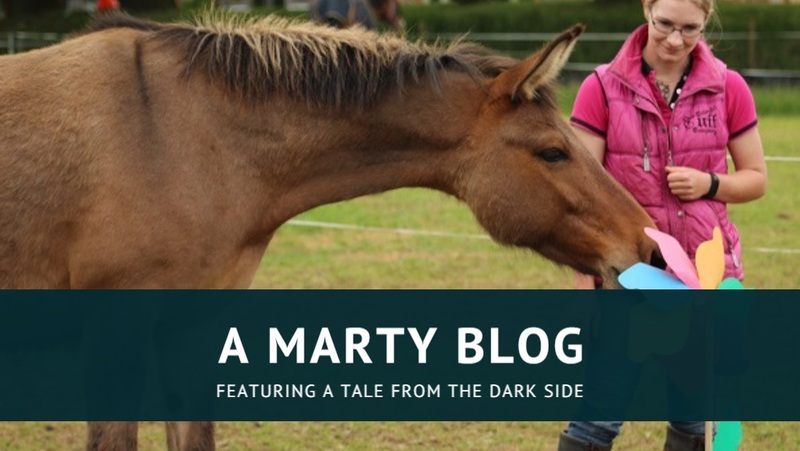 I hear many horse owners speak about “mareish” behaviour and I understand what that is, but I have not seen what most would describe as that behaviour in my girl. She comes to me from the pasture when I whistle for her and I think that says a lot. She is my girl and I am hers. The most important thing that I have learned is the difference between horses and mules and even donkeys. My father was a jockey, so I was raised on the racetrack always around thoroughbreds. Mules are much more relaxed and less reactive to all kinds of things that would set off most horses I have been around. They make their own assessment of situations and decide whether it is safe to proceed or not. 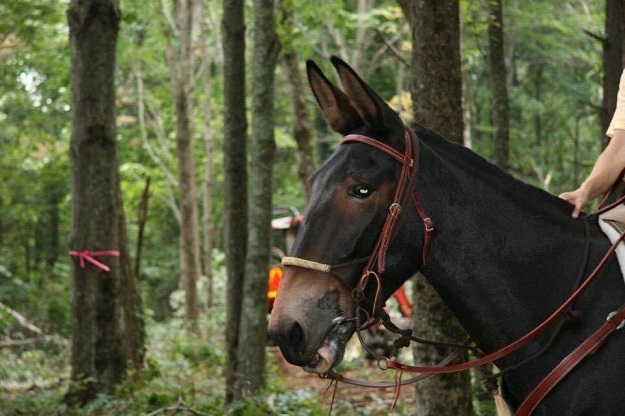 I have learned to almost ALWAYS trust my mule’s judgement. They have a greater intelligence than horses, only surpassed by the donkey from which their calm intelligence is derived. If you would like your mule to be featured here, or if you have a mule story that you would like to tell, then please contact me either via this blog, message me on my Mulography Facebook page, or email me at: herecirm (at) gmail.com. I would love to hear from mule owners anywhere around the globe! The mule wears saddles now. Saddles are cool.